The US Embassy in Egypt denied Saturday that US naval vessels near Egypt's shores are sent in preparation for military action. 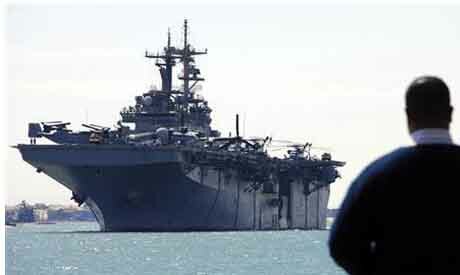 A top Marine Corps general said Thursday that two US marine vessels approached Egypt's Red Sea shore, raising concerns in the Egyptian media about an imminent military move. I would strongly suggest that the proper authorities investigate the media reports of a possible US invasion of Egypt for attempts to cause disorder and panic among the people. Of course this will not happen. Anyone who knows the Suez Canal and has any knowledge knows that US ships frequently pass through the canal and can often be spotted off the coast of Egypt. Does anyone really believe the Egyptian Army is not aware of this activity? Has no one ever seen the size of a US invading force, and why would the US be planning on invading Egypt? I know it is a sport here to hate the US and everything American, except Green Cards, but please. Egypt faces so many real problems right now that there is no need to make some up.